The music trade fair Midem has become a very movable feast. After years of being held in January, it switched to early June in 2015 and announced dates in late June in 2016. Many participants felt this was uncomfortably close to the summer break (and preparations for the summer festivals such as Glastonbury and others). But as the calendar of events in Cannes is pretty tight, they did not have much choice. Luckily, the organisers have been able to bring Midem forward and have announced the final date as the weekend of June 3-6, 2016. This will be the 50th anniversary of Midem (I remember the 40th! ), with suitable celebrations being planned. This replaces the previously-announced date of June 7-10, 2015. For the occasion, Midem will be holding the first International Midem Awards (more about this later). These dates also mean participants get to enjoy the summer temperatures in Cannes rather than the brisker January weather in the south of France. This will also be the first Midem under the leadership of Jérôme Delhaye, who replaced Bruno Crolot earlier this year. 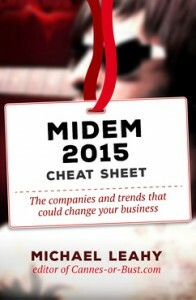 To find out what happens at Midem, check the Midem 2015 Cheat Sheet.